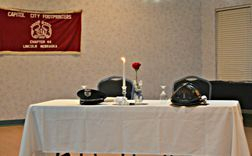 The Table, with its place settings, is a way of symbolizing the fact that members of the law enforcement community throughout our country are missing. The table is set for two, though the number is many. The Chairs are empty. They can no longer join us. The Tablecloth is white - symbolizing the purity of their intentions to serve their communities. The Candle is lit - symbolizing their spirit to serve. The Glasses are inverted - they cannot drink nor toast with us this day. 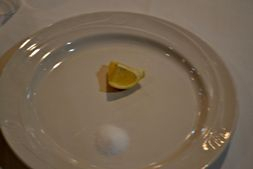 A slice of Lemon is on the plate to remind us of their bitter fate. 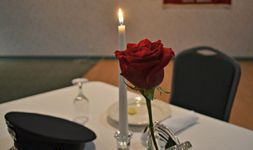 The single Red Rose displayed in the vase is to remind us of their families and loved ones. The Salt upon the plate is symbolic of their tears. The Blue Ribbon tied so prominently on the vase reminds us of the "Thin Blue Line" which stands strong before those who would destroy law and order in our great nation. Many of you served with these peace officers and called them "partner". We relied upon them; depended upon their might, and their aid. Surely they have not forsaken us. You called them "Brothers." You called them "Sisters." They watch over us still ~~ and we Honor them today.